The Su-6 was developed at the same time as the now-famous IL-2. Like the IL-2 it was heavily armed and in many ways quite similar. Unfortunately, Sukhoi chose to use the powerful M-71 engine and teething troubles with this engine delayed the aircraft to the point where the IL-2 was chosen. Like the original IL-2, the first Su-6 was a single seat aircraft. A bit later, in 1942, a competition was held for a two-seat ground attack aircraft and the Su-6 was redesigned for this purpose. Again the IL-2 was chosen, but not because it was a superior aircraft but because it was already in production and the changes to the airframe were minimal and would not take the time to implement as would a new design. The Su-6 was faster, more heavily armed and generally a better performer. A third competition was held in 1943 and this time the Su-6 was reengined with the AM-42 in-line engine, metal wings and lighter, but more powerful armament. 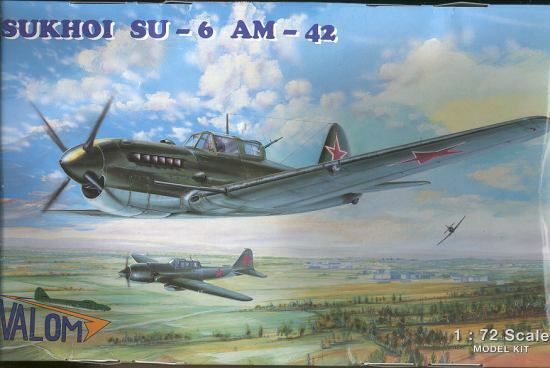 However, this time the IL-10 was able to beat the Su-6 and so once again, the aircraft was never put into production and only six prototypes were built. This is the first kit I have seen from Valom of the Czech Republic and as an initial issue, it is really quite impressive. First of all, it is a short run kit and has many of the features of these types of kits. This includes vac canopies and an etched metal fret, but no resin pieces. The plastic is very well molded with good detail and almost no flash. I only found one sink mark and that was in a very thick part that is the support for the seat so it won't be seen. The detail work on the parts is good, though perhaps a bit heavy for the scale. The engraved panel lines are more pronounced than one usually sees, but a coat of paint will help to tone them down a bit. Sprue attachment points are commendably small and should pose no problems. The plastic itself seems a bit harder than what one normally finds on these kits. I really like that the prop is a single part and not separate blades. I also like that the kit comes in zip bags so that the pieces can be resealed in them if need be. On the etched metal fret are things like bomb fins, instrument panel, gear oleo scissors, radiator grille, gear doors and some other small bits. One of these parts is also the bomb cradles. Not sure just how well these will be able to hold the bombs. Perhaps these bits should be done in plastic, but we'll see how it goes. The instructions are very well done. There are several exploded views showing where the parts go and there are smaller drawings to help with parts placement. Everything is well labeled and color information supplied for all parts. The color chart gives paint colors for Humbrol, Agma, Revell and Model Master as well as some FS numbers were appropriate. Well done! Decals are quite basic consisting of only insignia since the Su-6 never went beyond the prototype stage. They appear quite thin so should work well. 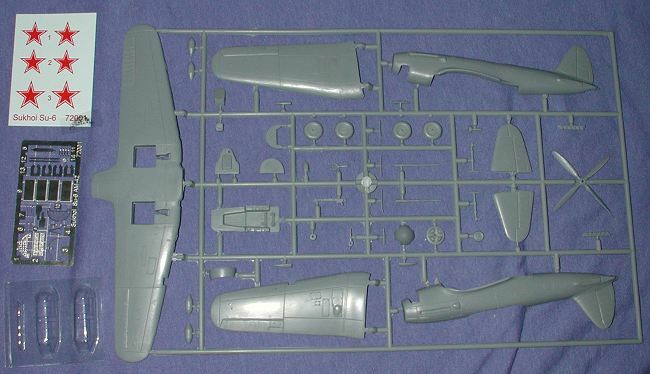 Overall this looks like a very good kit of a somewhat obscure Russian aircraft. There are a number of folks out there who like these kinds of subjects and so this is one you should seek. It is also a pretty cool looking aircraft and should make into a fine model. Review kit from the fine folks at Valom. Thank you for your support.